They say great things come in small packages; this is very true of Boom Kitchen curry kits with five kits available and two more on the way very soon, the kits contain all the base ingredients you need to make a restaurant quality curry without leaving the comfort of your kitchen. 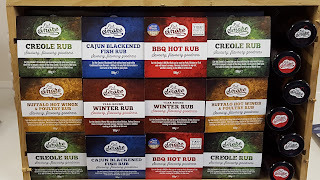 Each very well designed and eye-catching box of delights contains dried spices, coconut powder, chilli etc depending on the kit you buy but be sure you won’t find any additives, preservatives or any other unnecessary nasties - just good quality loveliness. They are gluten free too! The easy to follow instructions will put any unconfident cook at ease and even the student who has trouble cooking a pot noodle will find they can whip up a curry in twenty mins. So you’ve cook the curry opened a beer and your guests mouths are watering from the smells coming from your kitchen and they have run out of bombay mix so it’s time to eat. 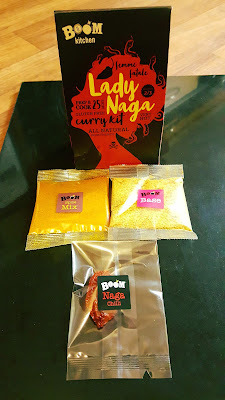 Each curry kit taste very different from the other so it’s definitely worth trying them all even if the hotter ones are out of your comfort zone - don’t just stick to a korma; you never know you might get converted to the hottest in the range the Lady Naga and this is one hot lady! Mix in ice cold fizzy water; if you have it still water will do, if not you are looking for a double cream consistency. The batter should coat the cauliflower without all falling off. 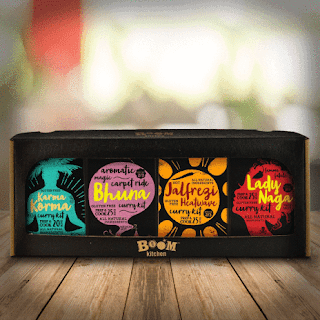 If you have tried BOOM Kitchen's products, let me know what you think!